Pinellia is a fascinating genus originating from Eastern Asia. Containing eight species, it exhibits a wide variety of leaf shape and size. 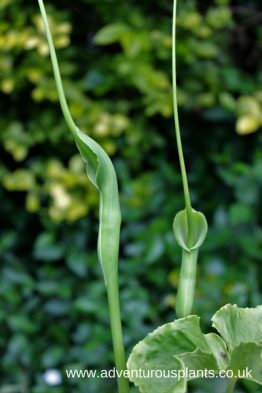 Readily grown from seed or bulbils, Pinellia make excellent garden plants or pot subjects. The inflorescences can be likened to a toned-down Arisaema! Do try this wonderful genus. We are cultivating five species – Pinellia cordata, pedatisecta, peltata, ternata and tripartita, and also one hybrid – Pinellia ‘Poly Spout’.